Downtime software (equipment failure tracking software) provides guidance to the maintenance manager targeting expensive problems resulting in increased availability and reliability. Equipment failure tracking software (downtime software) is essential for identifying problem areas with equipment, preventive maintenance, personnel, maintenance scheduling and even product issues. Indeed, all of these factors have an effect on equipment failures (downtime). That being said, our solution the only CMMS software that contains a dedicated equipment failure tracking software module. In short, our software solution places a large emphasis on optimizing your equipment maintenance operation. Most importantly, our system links reliability analysis to preventive maintenance. By doing so, the software suggests specific PM intervals needed to prevent downtime from occurring. This data originates from the downtime database and uses machine scheduled run time as part of its algorithm. By tracking downtime as its own cost center our downtime solution is able to use military standard reliability analysis to optimize your equipment reliability. Additionally, derive overall equipment effectiveness from the downtime data to obtain valuable equipment maintenance KPIs such as availability, equipment performance and product quality. Furthermore, the software rolls up these three KPIs to calculate OEE. The result is, OEE and reliability analysis give objective direction in allocating limited resources for preventive maintenance. 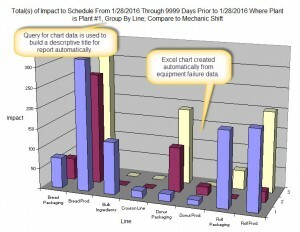 In addition, the downtime analysis software module focuses the maintenance planner on machines that are costing your organization big money. Our software tracks opportunity cost not just direct maintenance downtime costs. Without doubt, opportunity costs are often a much higher expense against the company as a whole than direct maintenance costs. To clarify, in a manufacturing company lost production time, remake expenses, lost ingredients, production employee overtime and poor compliance audits are all opportunity costs. Why Equipment Failure Tracking Software? MaintSmart is the only CMMS that has a built in downtime software module. All other CMMS use a work order to log downtime. The problem with this is that an equipment failure is not work. An equipment failure is an event . As such, tracking downtime separately provides the data needed to leverage powerful downtime analysis tools in the software. 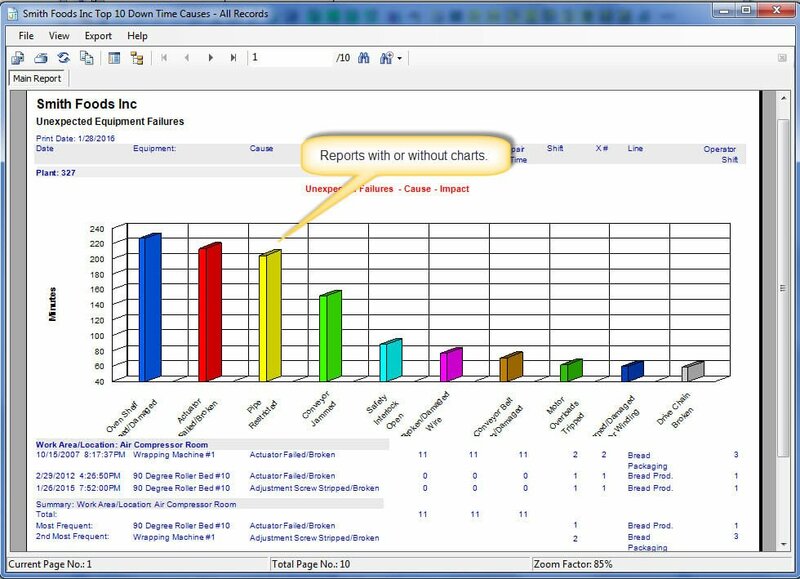 Furthermore, equipment failure data yields powerful decision-making reports and charts with downtime SQL query, overall equipment effectiveness and reliability analysis. Equipment breakdowns cost valuable production time and often result in lost product. Without doubt, tracking downtime is essential to realize a reliable and consistent manufacturing operation. In short, this is a complete downtime analysis and reporting solution. 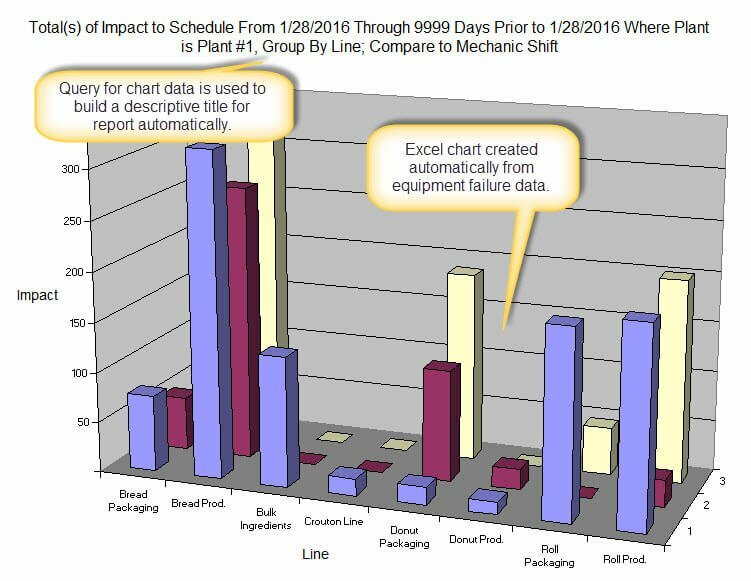 Use the downtime analysis to optimize equipment reliability and up time. Best of all, our solution provides for up to 999 separate manufacturing plant maintenance locations (or facilities) in one database. As such, the maintenance planner compares multiple locations and share spares between locations with ease. The downtime software module provides extensive analysis and reporting. Import all downtime data directly to Excel for further analysis as needed. Furthermore, this data automatically creates a detailed chart in Excel. 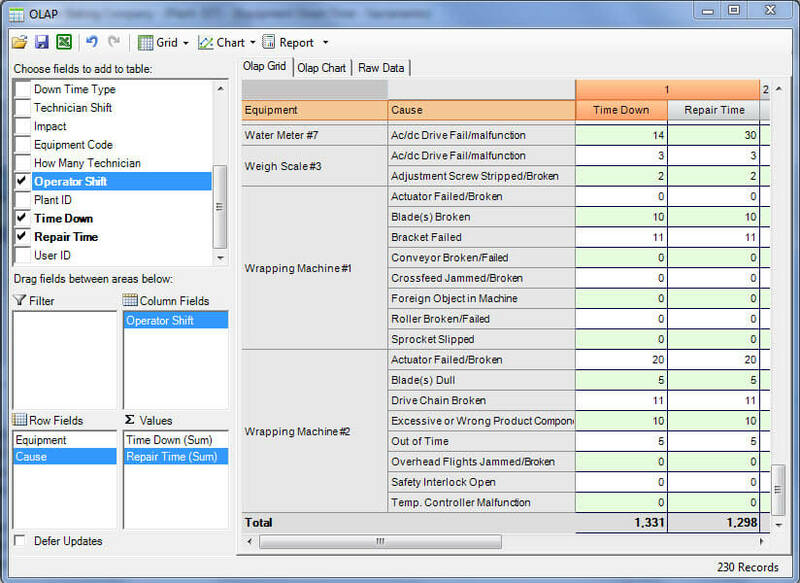 The downtime software functions include SQL grouped category analysis, pivot table analysis, top worst/best analysis, AMSAA reliability analysis (military standard) and OEE (overall equipment effectiveness). 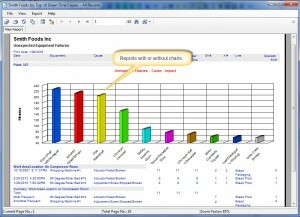 Additionally, drag and drop CMMS report builder build downtime data cubes with charts effortlessly. Best of all, use the event notification system in the CMMS when excessive or high priority downtime instances occur. This leads to quicker notification and subsequent resolution of equipment issues. Equipment Failure Tracking Software Analysis Module. Using OEE (overall equipment effectiness). Knowing which equipment items are costing your company the most money, not just in repair labor and parts but also in lost manufacturing time and product. The reliability analysis module yield powerful MTBF (mean time between failure) and failure rate. Mean Time Between Failure is the average time between failure occurrences. Failure Rate represents how often and what percentage is the chance of failure over a specified time period. 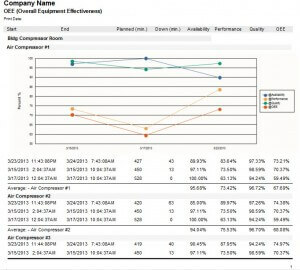 Another powerful KPI found only in our CMMS is overall equipment effectiveness. 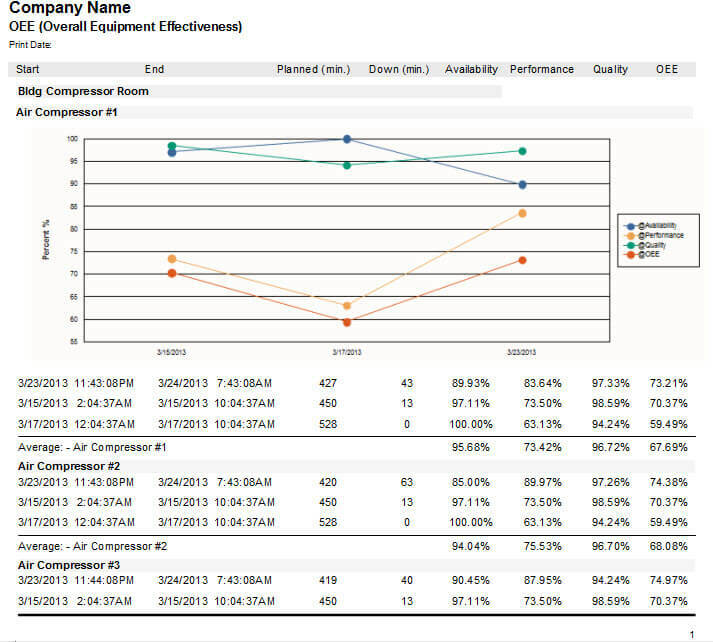 Overall Equipment Effectiveness = Performance * Availability * Quality. Do you want to find and correct problems (not just equipment problems) quickly and save time and money? 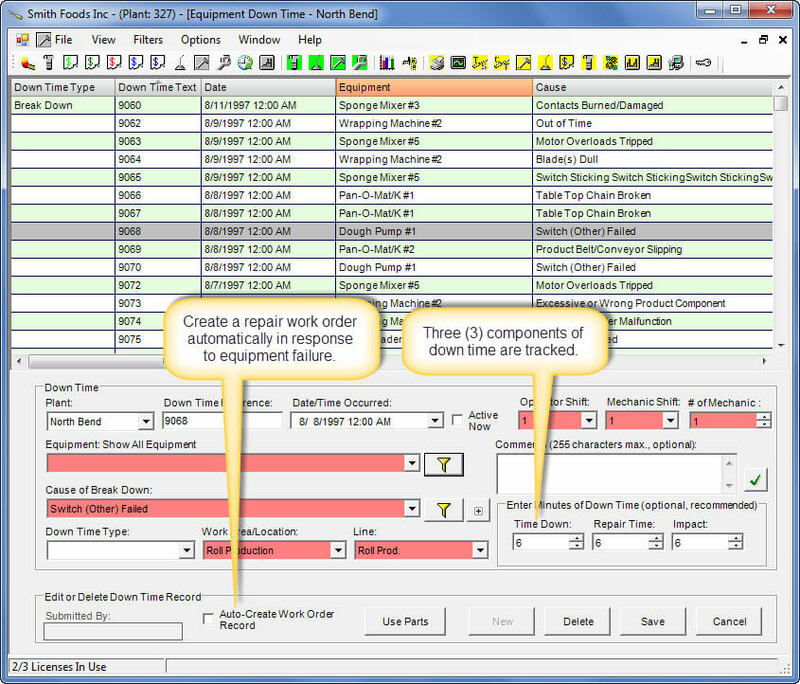 No other CMMS downtime software can do what our CMMS solution does with resolving equipment failure issues. How to export down time data to Excel and web page. Learn how to use reliability analysis module. Link spare parts to downtime records. 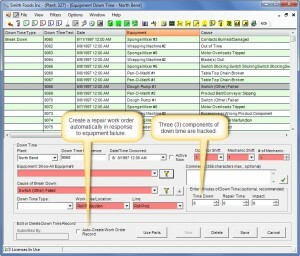 Alternatively, spares are used automatically when linked to a work order template. However, it makes more sense to link the spares to the work order generated in response to the downtime. Alternatively, if the maintenance manager prefers to accrue the parts expense against down time for the purposes of easily tracking all equipment failure expenses it is fine to link the spares to the downtime record itself. The point is, our system offers great flexibility in how to allocate spares costs. The downtime software screen tracks three types of down time: Time Down, Time To Repair and Impact. The user defines failure cause definitions as required. These failure causes may be queried later to determine the exact cause of failures. A time/date stamp and user name is linked to all equipment downtime records for accountability purposes. The downtime software analysis module has a report builder. Build any report by simple drag and drop. 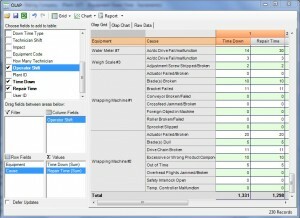 Use the report builder to create two or three dimensional data sets ridiculously easy. Depicted is a very simple downtime analysis query-builder scenario. Overall equipment effectiveness provides KPI (key performance indicators) derived from equipment failure data. OEE = Performance X Availability X Quality. Indeed, get the overall real picture of how your maintenance management program is performing by understanding the equipment effectiveness.